GRAFENWOEHR, Germany — Netzaberg recycling points saw the addition of three new paper and cardboard containers July 3, to assist community members in meeting German recycling requirements. The large recycled paper containers — now a total of 11 in the Netzaberg community — are located at the neighborhood’s three recycling sites, listed on page 12 of the Netzaberg Recycling Guide. Regular curbside pickup of blue paper and cardboard bins at each house also continues on a monthly basis. Prompted by Netzaberg residents’ concerns about overflowing bins at recycling points, U.S. Army Garrison Bavaria requested additional containers from Neustadt County’s Waste Management Office in June, said Helmut Bueller, Tower Barracks Waste Management Officer and SORT Coordinator. According to Bueller, discussions between the garrison and Neustadt County originally included additional metal, glass and paper recycling containers as well, but further analysis determined that the current containers and pick-up schedule is sufficient for the number of residents. It all comes down to learning the German rules for sorting and recycling, said USAG Bavaria’s command sergeant major, Command Sgt. Maj. Robert Todd. The county of Neustadt, which has about 100,000 residents total including residents of Netzaberg, collects an average of 60 liters of refuse and 240 liters of paper and cardboard per pick-up cycle from German households. 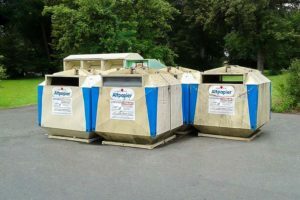 U.S. households in Netzaberg are issued 240-liter containers for both refuse and paper. The annual pickup schedule for Netzaberg waste is available as a large magnetized calendar at Self-Help. For more on trash and recycling at USAG Bavaria, see the beginner’s guide to trash and recycling at USAG Bavaria, everything you need to know about trash and recycling in Netzaberg and the Trash & Recycling Program’s page at www.Bavaria.army.mil/trash. Questions? Contact the Tower Barracks SORT Coordinator at DSN 475-6664, CIV 09641-83-6664 or stop by Bldg. 329.